Heat oven to 350ºF. Spray 13x9-inch (3-quart) glass baking dish with cooking spray. In 12-inch nonstick skillet, cook ground beef over medium-high heat, stirring frequently, until thoroughly cooked; drain. Stir in water and taco seasoning mix. Bring to a boil; cook 2 to 4 minutes, stirring occasionally, until thickened. Stir in chiles. Spread refried beans in baking dish. Top with ground beef mixture. Cover tightly with foil. Bake 30 to 40 minutes or until bubbly around edges. Remove from oven. Uncover; sprinkle with cheese, tomato, onions and olives. 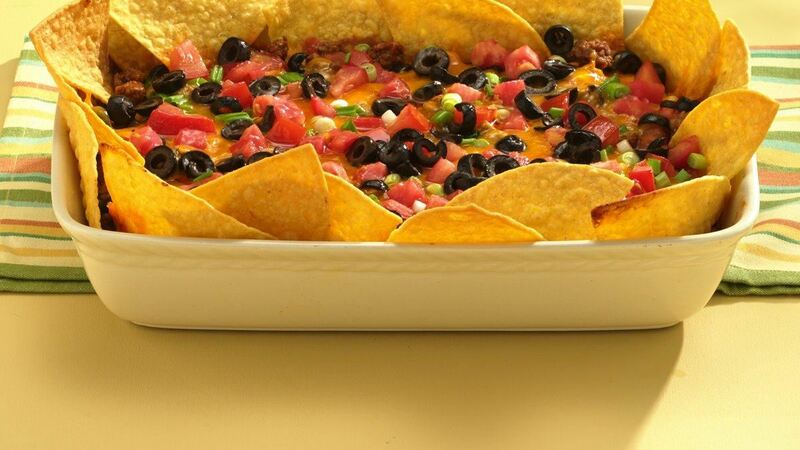 Arrange 18 to 20 tortilla chips around outside edges of baking dish. Return to oven; bake uncovered about 10 minutes longer or until cheese is melted. If desired, top with sour cream. Serve with remaining tortilla chips for scooping.